We continue to consider how to integrate elements of the Next Generation Science Standards (NGSS) into our design challenges. 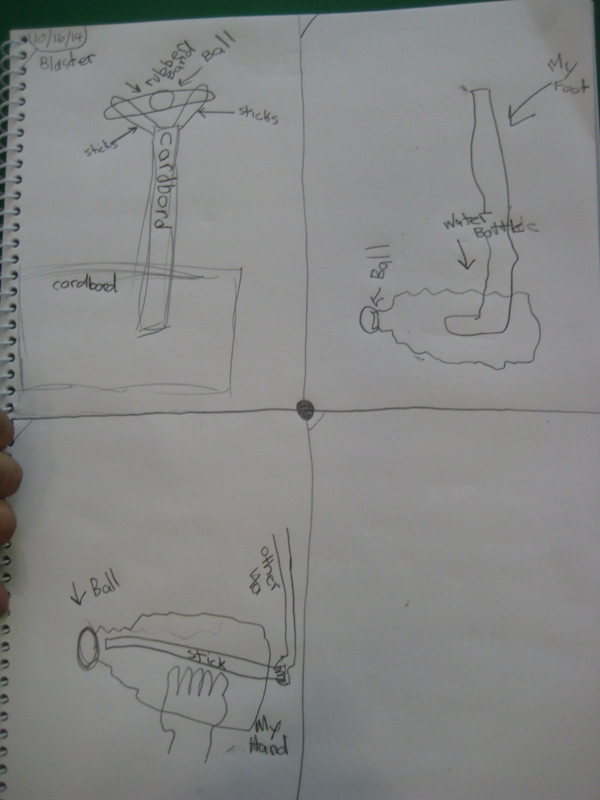 The Science Framework notes that “engineering and technology provide opportunities for students to deepen their understanding of science by applying their developing scientific knowledge to the solution of practical problems.” After working on a zip line challenge a month ago, we wanted to revisit some of the NGSS concepts introduced and build on our students’ understanding of not only the Motion and Stability core idea but also the Engineering and Design components. To extend their previous experience with gravity and speed, we introduced a challenge which involved launching a ping-pong ball from 2 meters into a bucket. 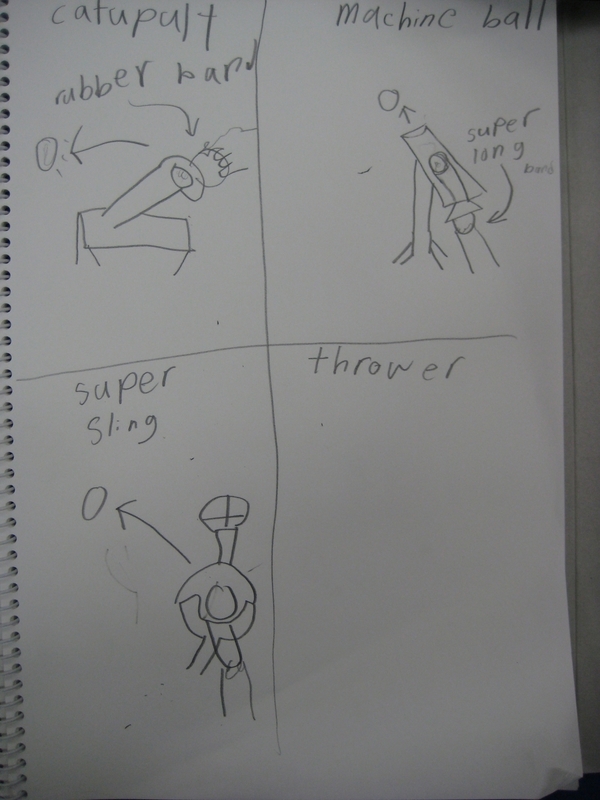 We crafted a "needs statement": MeMu kids need a device to launch ping-pong balls into a bucket in order to have a BLAST and prepare for the Halloween Carnival! Research science concepts using a bit.ly of YouTube videos and articles we had found. Take notes on concepts. During this design experience we scaffolded the science conversation a little more intentionally. We took the pulse of understanding several times throughout the planning and building stages. 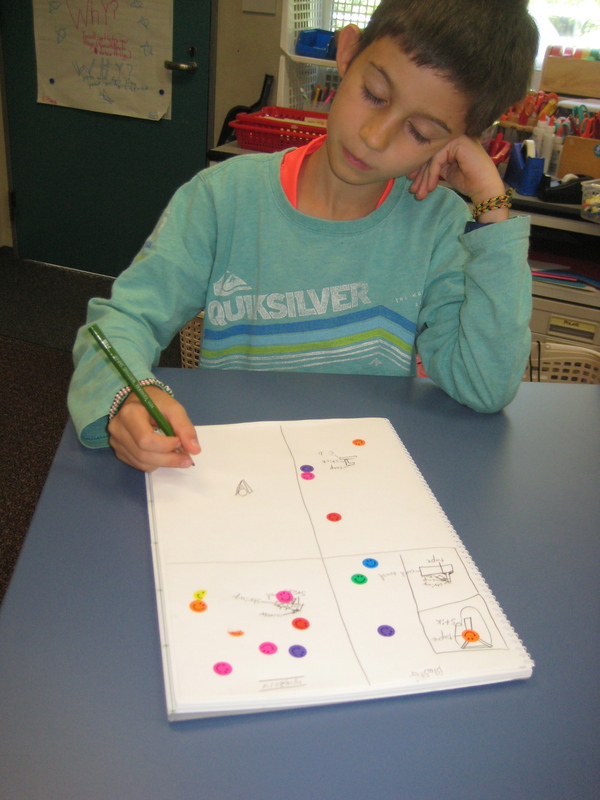 For example, once we introduced the challenge to the students, we immediately asked what might help us when planning out designs. The initial turn and talk started to gather some science ideas the students had. After immersing ourselves in videos of the specific scientific concepts, we asked the students to take notes, discuss notes, and build on their notes. When we fed-out as a group they had a clear and common understanding of some of the science behind the challenge. 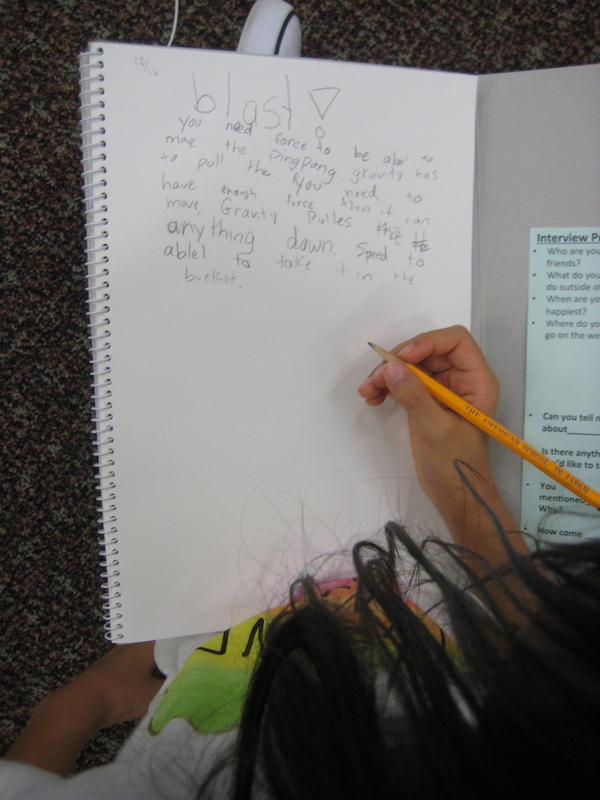 We asked the students to complete a reflection about how the science concepts directly impacted their designs. By continually coming back to the science concepts, we noticed that the students were able to talk about them with much more depth than they were in our previous challenge. All of the students were able to explain their thinking tying it directly to science ideas. We have a hunch that their ability to synthesize was because they had an opportunity to dive deeper since we spiralled the science concepts embedded within the challenges; they might also have been successful due to the frequency of mid-lesson pauses to explicitly re-teach the science content. 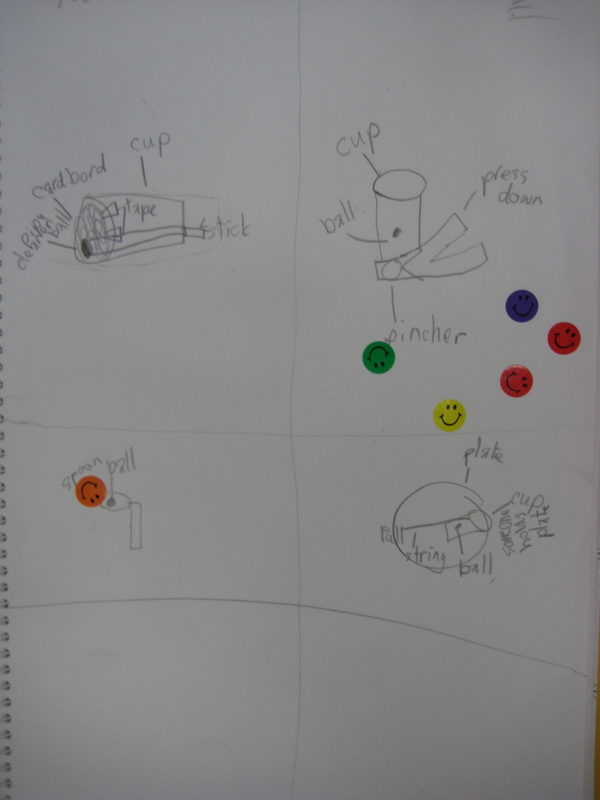 Another thing we noticed was that once children started to test their designs, their conversations about how to make adjustments were very specific and directly related to their science understandings. We asked children to have a partner that they could work with to pitch an idea even if they weren’t working as a design team. We find that when the students engage in conversation it not only helps them explain their thinking but also cultivates listening skills. Additionally, it allows partnerships to build off of each other’s thinking. WHAT MIGHT WE CONSIDER NEXT TIME? 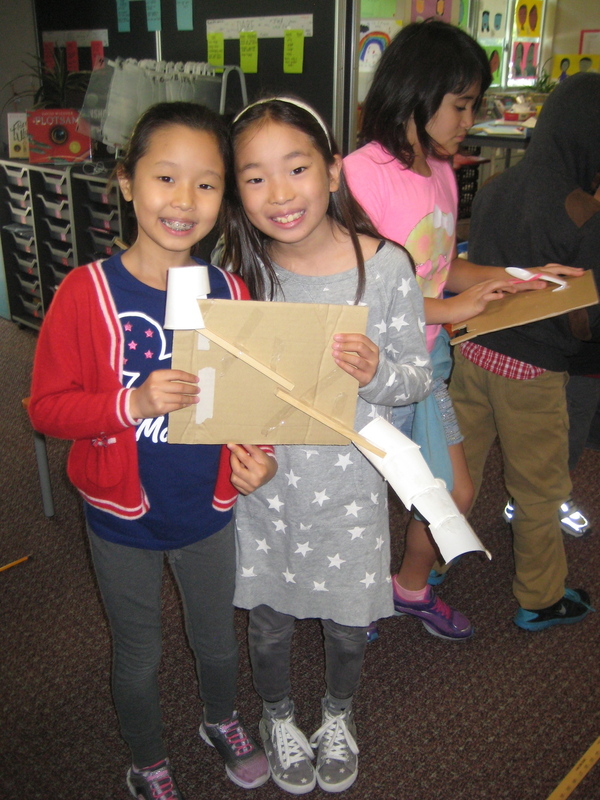 We recognize that something as simple as the name of a design challenge can serve to shape some of the students’ thinking. The title can tap into preconceptions about what is possible. In order to open possibilities of designs, next time we would to remove the word “blaster” from the title. 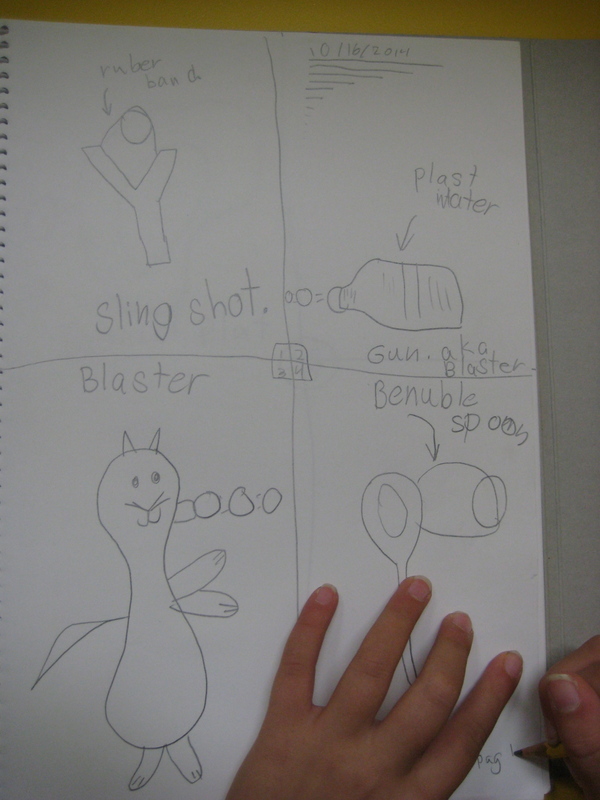 Many designs were limited due to interpretations of the word “blaster.” Upon recognizing this thinking motion, we had a mid-design teaching point where we highlighted some alternative options based on children’s work in the classroom, i.e. a type of fishing pole, giant pincers or a “bat”.